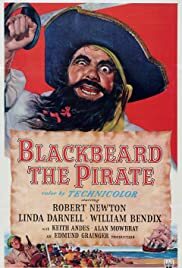 During the 1700s, pirate Captain Vallo seizes a British warship and gets involved in various money-making schemes involving Caribbean rebels led by El Libre, British envoy Baron Jose Gruda, and a beautiful courtesan named Consuelo. Blackbeard: Gilly, Gilly, give him just a tickle with the point of your blade, at about his liver. Opening credits prologue: "The meeker the man, the more pirate he, Snug in his armchair, far from the sea, And reason commends his position: He has all of the fun and none of the woes, Masters the ladies and scuttles his foes, And cheats both the noose and perdition!" This is a lot of fun,but is not for those who insist on subtle acting.Newton has the time of his life as a drunken psychotic.He really does go over the top.The dialogue is rather good,all things being considered,and the plot is better than one might have expected.There are only 3 or 4 loose ends.Darnell,Andese,and Thatcher all do quite well with their roles,and the pirates are as grisly a crew of jackals as you could imagine. (Gilly,in particular,not only acts well,but is nicely creepy,besides. )The only major disappointment is bendix;this fine performer wasn't suited for costume dramas.A good picture for kids ages 12 and under,or for those with a broad sense of humor.